Peugeot and Mitsubishi have worked together to commercialize the i MiEV in Europe via Peugeot as its rebadged version called the iOn. 100,000 i MiEV. 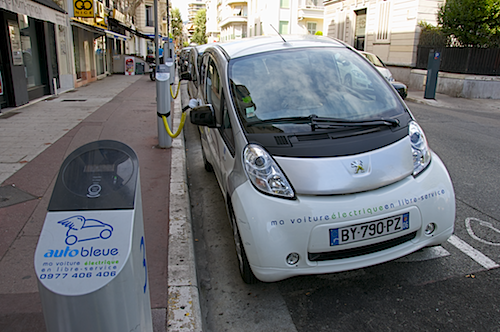 Mitsubishi Motors announced it temporarily halted shipments of its flagship electric car i-MiEV to PSA Peugeot Citroen. Branded as the iOn for Peugeot and the C-Zero for Citroën in Europe, Mitsubishi is stopping deliveries of the vehicles in order to readjust the company’s stocks. The supply deal was signed two years ago and is coming to a temporary halt as 100,000 electric i MiEV were ordered since 2010. Mitsubishi said it has already made 28,000 i-MiEVs for Japan since 2009. According to a Mitsubishi spokesman in Tokyo for AFP: "This is a temporary stoppage for adjusting stocks (of inventory). We are the supplier, and we fill the orders of the client." I also saw another funky little electric car called the Mia that shows how much electric car engineers can exercise their innovation. This little electric vehicle, EV has two big sliding doors on each side and three seats. The driver sits up front and two passenger seats are conveniently located behind. There is also a specially made European type of van that was is to accommodate wheelchairs. Success, Or Not? As with any new technology, it all depends on how you gauge success. If you listen to Wall Street investor’s unbridled enthusiasm for unsustainable exponential economic growth, then it will disappoint you. If you take a more mature approach to the true market demand, then the introduction is fairly successful. However you look at it, it’s practical. It wouldn’t be a stretch to do the same in the US. We could easily have a three to 4 electric car group conveniently located in a few busy areas of cities. With a younger generation less and less inclined in owning cars, making these electric cars available to this generation when needed at an affordable rate would be of great help. And practicality is what it’s all about. People who live in these cities without cars can rent one for a few hours, do their groceries, drop them off at home then go take a walk not too far away to park the car back at a charging station. This is yet another solution to an increasingly difficult problem to resolve in congested cities. 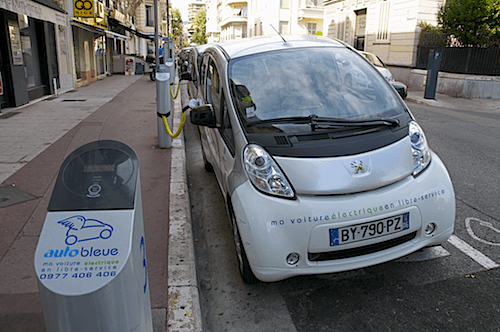 With a rising pollution, ill-effects on health and the cost of car ownership skyrocketing, sharing electric cars in heavily populated cities, much as the Nice, France Auto Bleu system does make a lot of sense. And as to Mitsubishi, we can only congratulate them on building more than 100,000 i MiEVs.